How can the sky hold so much water? Snowfall dominates the watcher, the Brownian dance of crystalline H20 swept by the winds into crevices and peaks, evanescent but hypnotic and alive in the mind’s eye. The UK at the moment is living through its snowiest, and hence whiniest, period for 20 years. The mind is boggled at the immensity of this event – think on this, enough solid material is falling from the sky to cover a whole country to a depth of a foot in one day – and it never looks like it’ll ever run out, just that some random temperature shift has chosen to drop a tiny sample of it on your head at that time. That must be a staggering amount of ice particles just floating around the world in the clouds, right? Well, it’s not. It’s a fantastically tiny amount of water: 3,100 cubic miles or 12,900 cubic kilometres. That might sound like a lot, but that’s only about 0.04% of the total fresh water in the world, which is itself only 2.5% of the world’s water. It just looks bigger because ice, and in particular the gloriously space-inefficient snow, takes up a lot more room than liquid water and because us anthropocentric humans have a tendency to focus on the tiny part of the environment we inhabit, the exposed skin of the earth, and forget the ocean’s depths. This air-borne liquid is a tiny proportion of the world’s total water, and an equally tiny element of the world’s fresh water (which, incidentally, is going to be a source of conflict in the parched areas of the world over the next decade.) 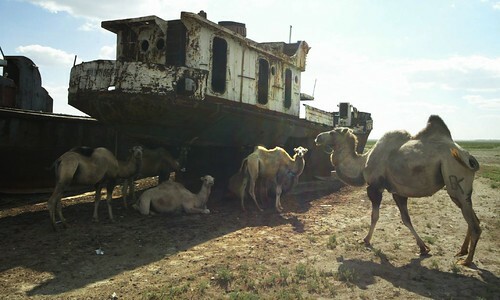 However, land-based fresh water is essentially one giant reservoir – with insufficient top up from this constantly replenished 0.04% of airborne water, it would empty relatively quickly (look at the disappearance of the Aral sea). If this system breaks down, even slightly, we’re going to have an unimaginable world drought. And it might. J.G. Ballard’s The Drought (AKA The Burning World) showed effectively and imaginatively what a world would be like if this tiny amount of Fresh Water vanished. The Drought has several parallels with Vonnegut’s Cat’s Cradle, the most important of which is a theory of chemical polymerisation of water caused by chemical pollution – in Vonnegut’s less-likely theory it’s a new type of water molecule that causes a chain reaction in other molecules, like a catalyst or an exponential reaction, but in Ballard’s book it’s the destruction of the precipitation cycle by industrial waste that stops evaporation. The latter seems equally fantastical but in the last few years ‘neustonic plastic islands have been found covering substantial proportions of the Oceans, including what was once the beautiful Sargasso Sea (a mid-ocean gyre with its own species of seaweed and a key location for ocean-going turtles.) These are mainly tiny particulates that float at the sea’s surface, where evaporation occurs – and concentrates like these slow the speed of evaporation. So this is just to say: don’t whinge about the snow. If it stops, we’re dead.